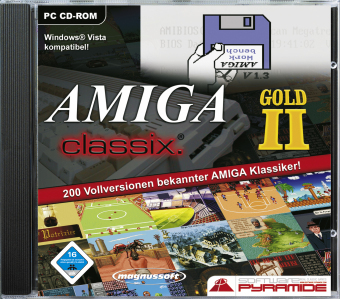 Go Retro - Amiga ClassiX Gold 2 comes with 200 full versions of famous Amiga classic games! The game menu lets you start the games conveniently on Windows. No matter whether you like action games, adventures games or strategy games best, Amiga ClassiX Gold 2 revives those classics from the eighties. Some of the included games are: TVSports, Trapped, Dragonslayer, Holiday Maker, King of Chicago, Logical, Lords of the Rising Sun, Der Patrizier, SternSiedler, Trapped 2, Anstoss, Hanse - Die Expedition, Defender of the Crown and many more.